3.75-12 Tyre with Alloy Wheel: 12 months Guarantee. 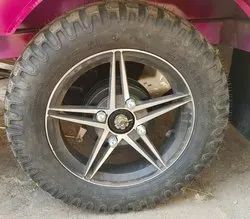 Both Tyre and Alloy Wheel are Indian make. Best E-Rickshaw Tyre. Good Quality Tyre. Riding on unfathomable volumes of industrial expertise, we are engaged in offering a broad assortment of E Rickshaw Chassis. To meet variegated demands of our esteemed clients, we are engaged in manufacturing an exclusive range of E Rickshaw Fiber Roof. One can avail from us a quality approved assortment of Baffle Assembly. Owing to their top quality, our products are extremely praised amongst the patrons. We are reputed manufacturer of E- Rickshaw Components. We are a top-notch organization, engaged in providing E-rickshaw Chassis. We are a top notch supplier of E Rickshaw shocker. We are engaged in offering E Rickshaw Chassis. 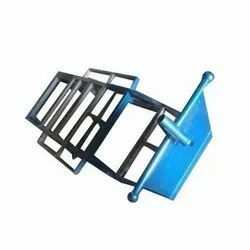 Our company has been successful in winning appreciation from the clients as one of the most prominent names in supply of Electric Rickshaw Balancing Rod.